In 46 poems, across five sections and 86 pages, poet Kim Garcia offers a panoply of perspectives on how we conduct modern war at a distance. There are poems written in the voices, minds, and tongues of pilots, wives, and targets—something for everyone. And, in the midst of desert images and intellectual constructions, there are also birds and bees and honeycomb. There are slow, meticulous observations of character and terrain, followed by quick strikes of eye-opening invention. The book was published late 2016 by The Backwaters Press. The collection, on first readings, may feel a little atmospheric, distant, or aloof. Perhaps this is due to the subject matter, or to the book's origins in a 2014 interdisciplinary conference on drones and remote warfare held at Boston College. Garcia's titles are often presented in clipped, militaristic syntax. Consider, for example, labels such as "Kevlar, Carbon, Quartz" and "Blue Early Morning Snow, Home Front." The cover image seems a similar blend of warm welcome and cold efficiency. 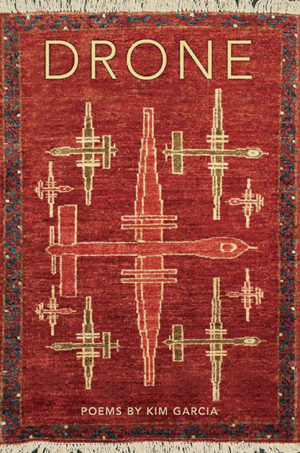 The soft, matte photograph reproduces an Afghan rug depicting bird's eye views of various U.S.-style drones, similar in shape to MQ-1 "Predator" or MQ-9 "Reaper." Each has a tail propeller, and bears missiles under each wing. Mixed messages. Perhaps this is an example of "Beware Trojan birds bearing gifts"? everywhere from nowhere, raining fire. in infrared, grids and pixel-prisons. from his truck and mows the back lawn. And, in "Old Friends," Garcia relates the loss of Omar, a young Turkish man the poet once knew. and touching his heart, his mouth, his forehead, when he saw me. 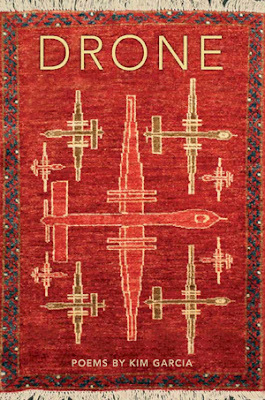 Garcia's "Drone" is an essential addition to the growing number of 21st century war poetry collections, and delivers a truth-seeking payload to a target located smack between technological tools and human tolls. "Drone" is available in trade paperback via Amazon and other booksellers.